Who were the famous Twin Sisters and what happened to them after the Battle of San Jacinto? During the Texas Revolution, the Army lacked a key element of equipment to help them win – artillery. 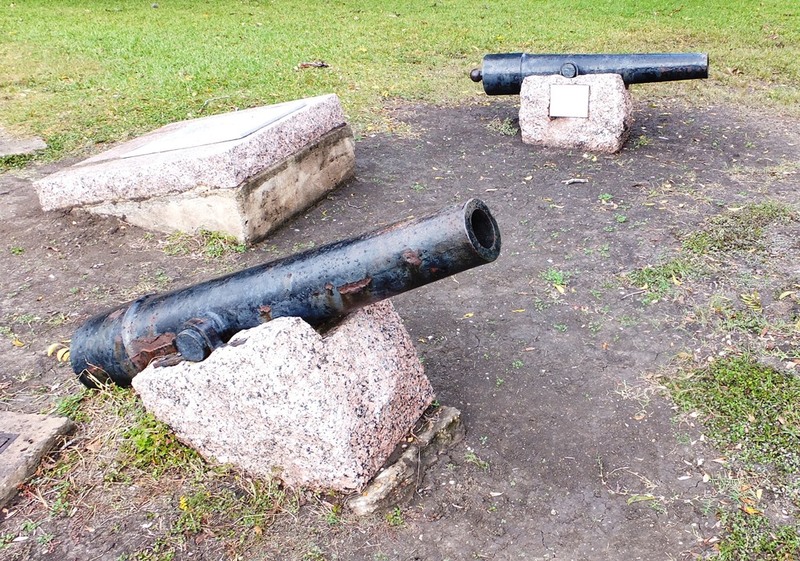 A resident of Cincinnati, Francis Smith, made it his cause to raise funds from the city’s citizens to build two, 6 pound cannons to aid the Texans. They were manufactured at a local foundry, Greenwood & Webb, and shipped to New Orleans on a river boat. A freight agent, William Bryan, loaded the cannons on the Pennsylvania, a schooner bound for Galveston. Aboard the ship were Dr. Charles Rice and his family. 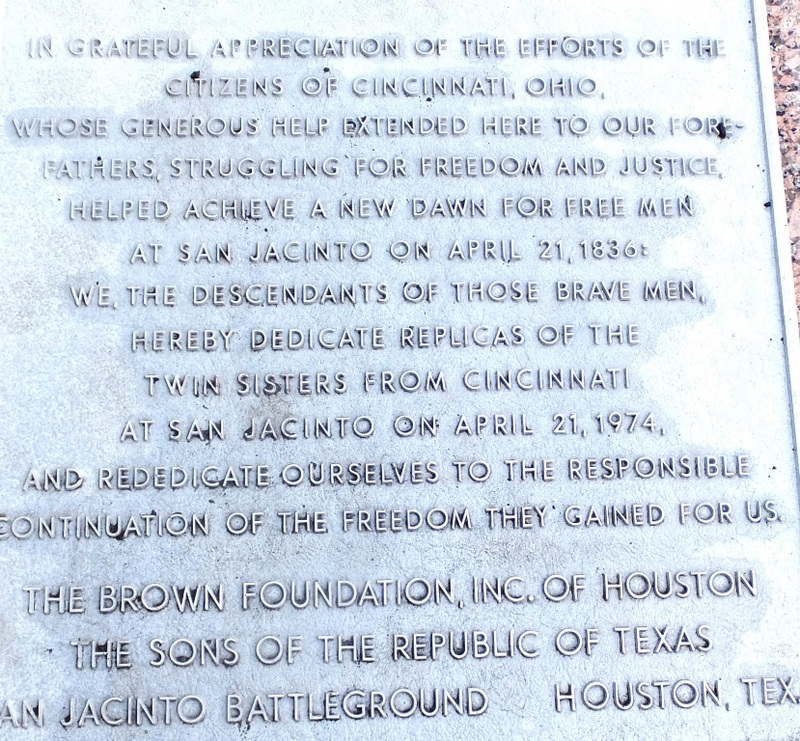 He presented the cannons to Texas authorities under the sponsorship of his twin daughters, Elizabeth and Eleanor. Someone in attendance noticed there were two sets of twins – the girls and the cannons – and immediately named the latter the Twin Sisters. General Sam Houston took control of the guns just before the Battle of San Jacinto on April 21, 1836. They proved their value under fire. The Twins fired the first volley of the Battle into the Mexican Camp causing enough confusion to allow the Texans to kill 600 Mexican troops and capture 600 more. The fight was over in 18 minutes. Their place in Texas history was assured. In 1840 the cannons were in Austin. On April 21, 1841 they were fired to celebrate the fifth anniversary of the Battle. The Twins were fired again at Sam Houston’s inauguration as President of the Republic. Little is known about them following 1845. Some suspect the Twins were turned over to the U. S. Army, though by then they were considered relics. Somehow they ended up in Louisiana – one in a foundry scrap heap, the other in a gun collection. In 1861 they were returned to Texas at the beginning of the War Between the States. The Twins were fired during the Battle of Galveston (1863), stored in an Austin arsenal and sent to the Rio Grande area. Near the end of the War there were reportedly seen in Houston. Then the cannons disappeared forever. Most believe they were buried in the Harrisburg area so Union troops could not use them. Wherever they are, the Twins final resting place remains a Texas mystery.